With a chilling theme, that will knock any premise you ever had about Santa and his elves off its axis, Santa Strikes Back! slot tells the story of a man, responsible for supplying the whole world’s children with presents in just one night and how he finally cracked. Chock full of special features and bonus, this progressive jackpot slot will progressively draw you into its reels. 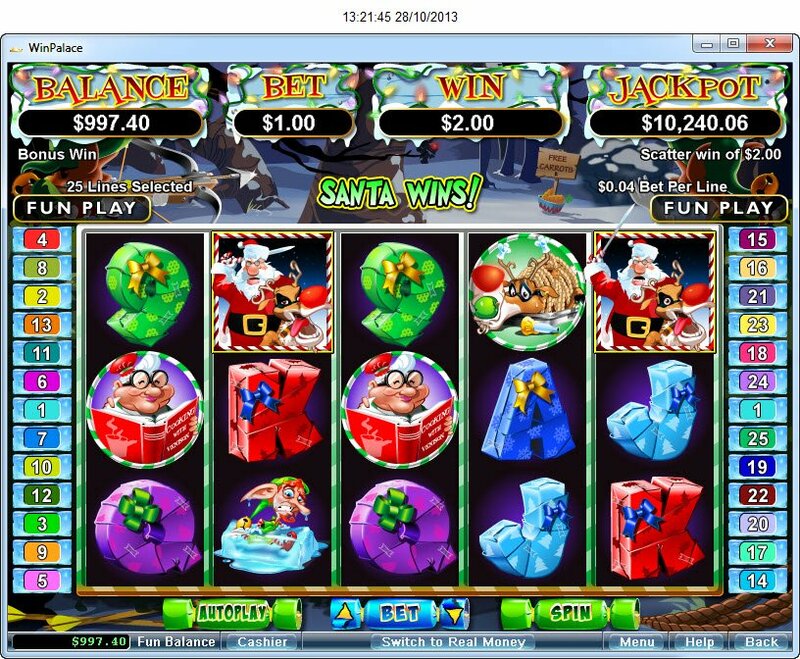 Online casinos offering Santa Strikes Back! There must have been a lot of naughty girls and boys this year, 'cos Santa is striking back! Could it really be? Our sweet, old and white haired giver of gifts now armed and dangerous, with a sword swiping at whomsoever may cross his path? Has Santa broken? Are we to see him carted off in a white straight jacket, with jingle bells adorning it? Luckily, we do not have to worry about any damaging scars, mental or physical on our kids as they watch Santa being dragged away, it is just his staff and reindeer his is embroiled in a fight with. There's a range of Santa's gnomes, one looks angry and like he is throttling one of Santa's reindeer. Whilst the seemingly tongue in cheek humour behind the nature of this Christmas themed offering is most welcome, the brightly wrapped presents that have been made of those high card value symbols is also refreshing. With a pretty bow attached to each too. There's a range of Santa's gnomes, one looks angry and like he is throttling one of Santa's reindeer. The other has his smiling nose in a book, ignoring all the kerfuffle. 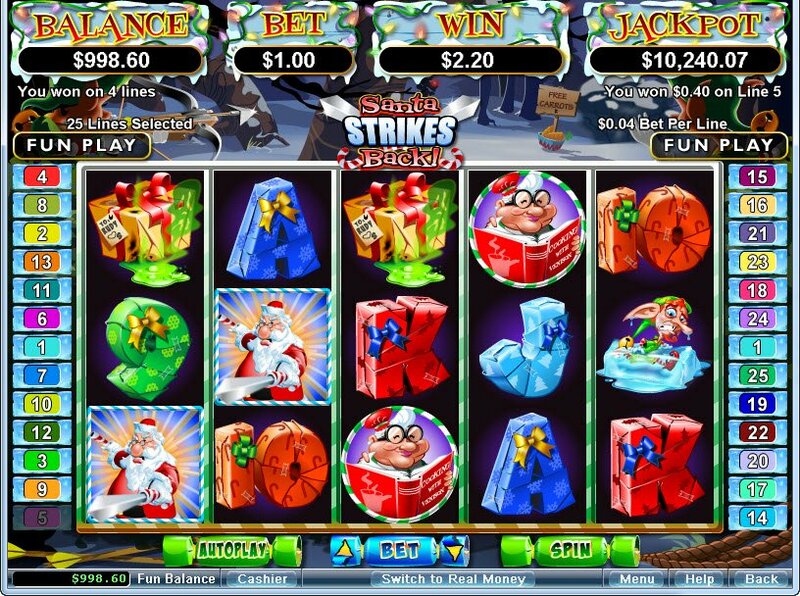 The Santa Strikes Back slot jackpot is inched up by symbols, so the more you play, the larger your reward could be. In the North Pole, Santa substitutes for all other symbols and will increase your winning power on the reels. Both a Victorious Santa, and a Victorious Rudolph will scatter your winnings, and multiply them for good measure. They each respectively trigger the Santa Strikes Back! bonus feature, and the Rudolph's Revenge bonus feature. Rudolph will sweeten you up with Santa Strikes Back! slot free spins, and will be multiplied by a nice even two. 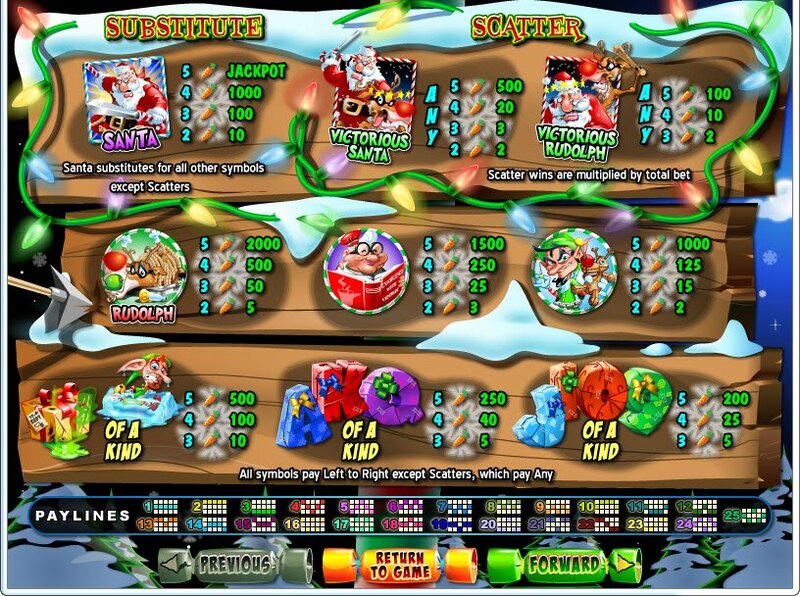 Santa's bonus round involves a candy cane, stars, and resettable free spins. You gotta spin it to believe it!